It is not known exactly when or where the first soap was made. According to Roman legend, soap was discovered in the rainwater with which people washed on the slopes of Mount Sapo, near the River Tiber. The tallow from the many animal sacrifices combined with the wood ash from ceremonial fires, and slaves noticed its properties first for washing their hands, and then their clothes. Documentary evidence from primitive cultures has allowed us to study the origin of soap. This is the case, for example, of Babylonian clay pots dating back to around 2800 BC, whose inscriptions describe a mixture of fat boiled with ashes. 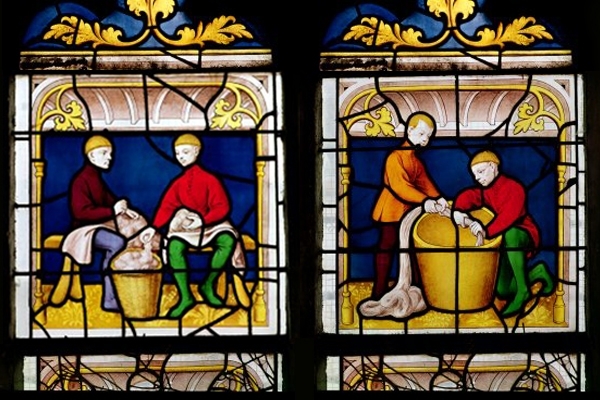 Another theory refers to the Celtic origin of soap. Whatever its origin, what we do know is that the Romans contributed greatly to its widespread use. The theories of Galen of Pergamum, a prominent Roman physician, were very influential in the Middle Ages. He was the first to talk about the use of soap for healing, personal hygiene and washing clothes. He also noted that keeping clean had a curative effect on skin diseases. The soap industry flourished in the Mediterranean coastal cities in countries such as Spain and Italy, supported by the abundance of olive oil. In the fifteenth century the appearance of Marseille soap, made with a mixture of vegetable fats, was a landmark in the product’s history. However, during this time of the late Middle Ages, the dramatic spread of the Black Death through Europe led bathing to be regarded as a dangerous activity because of the belief that water and humidity were highly contagious. This meant people took baths or washed their clothes or homes very infrequently, and thus, without knowing, they helped the epidemic to spread. In the Renaissance the custom of bathing only once or twice a year continued; at the same time, as a direct consequence the perfume industry boomed, precisely to hide the inevitable odours. Soap making remained a small and relatively primitive art until the eighteenth century, when techniques to create a pure soap were developed and changed people’s awareness of the importance of hygiene. Several French chemists made significant progress in the soap industry, discovering and developing ways to obtain soda based on common salt, or describing in detail the process of saponification. Moreover, the findings of Louis Pasteur demonstrated that personal hygiene reduced the spread of disease. This allowed significant progress to be made and led to the professionalization and expansion of soap manufacturing. Major changes arrived in the mid-nineteenth century, including the first mechanical washing machine. This was like a closed bath with wooden paddles that afforded the user a better posture, avoided the need for constantly wet hands, and saved time in the laundry. Scientific discoveries, along with the development of the power to operate factories, turned soap manufacture into a major industry. The widespread availability of soap transformed it from a luxury item to a basic need. As a consequence, milder soaps were developed for bathing and personal hygiene and for use in the first washing machines. The first detergents appeared in Germany in 1916, but did not really take off until the Second World War. In this period there was a shortage of animal and vegetable fats, essential for the manufacture of soap, and so manufacturers began to use other chemical ingredients which were much cheaper and easier to handle. After 1950, soap products were gradually replaced by synthetic detergents. These are also products used to wash clothes but they are ‘synthesized’ or mixed with chemical ingredients. This combination worked very well because it removed stains, so detergents became a common product in every home, and began to outsell the traditional soap that was virtually limited to soap bars and soap flakes. In the second half of the twentieth century development of easy-to-use chemical cleaning products continued. 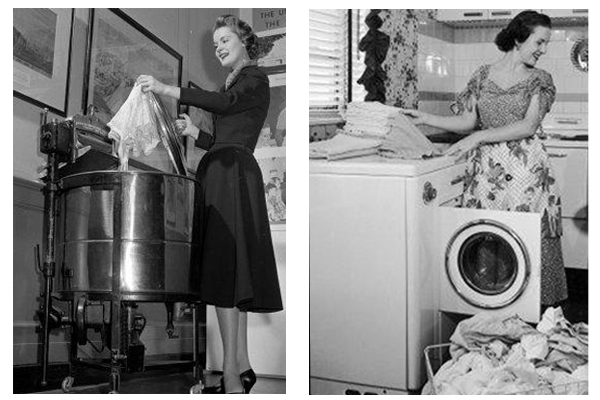 Some innovations were the automatic washing powders, fabric softeners, detergents with bleach, powders with enzymes, stain removers, concentrated detergents, and a host of products with which new consumer needs are being created. But this massive development of chemicals has also aroused concern about its impact on the environment. The first water treatment plants appeared and environmental awareness questioned the inclusion of some harmful chemicals in detergents, such as phosphates, and encouraged research into biodegradable ingredients, which are removed easily and can be assimilated by some bacteria. Today the struggle still continues to get rid of the problems caused by the uncontrolled disposal of detergents: foams that hinder the dilution of oxygen in water, toxicity in agriculture by using water with traces of detergents, pollution of aquatic life; and eutrophication, which causes many algae to proliferate and produces a notable reduction in the oxygen that aquatic fauna need.